Dutch Beaumont M 1873 Navy rifle 11 mm. S# A 325 on crossguard. Excellent bright fullered yatagan blade with some very thin pitting (peppering) near the tip only. Dutch makers name P. STEVENS, MAASTRICHT in two rows on ricasso and a Belgium inspector mark Crown over JF in a trilob on the reverse side. Excellent brass hilt with long 72 mm spring secured with a large screw and old holes from former short spring filled with brass. Excellent bright crossguard with fast forward swept quillon showing a low serial number A 325 and 2325 on the reverse. Muzzle ring MRD 17,5 mm. 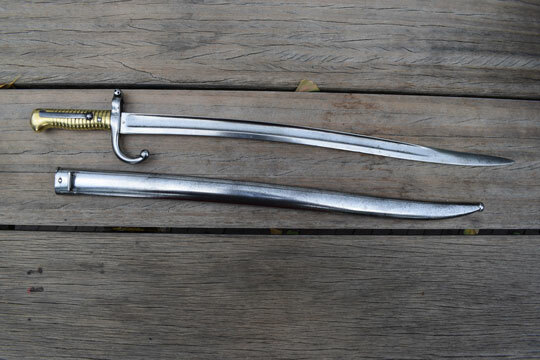 Excellent and correct bright finished metal scabbard with no dents and no serial number. Only 5.400 Beaumont navy rifles and bayonets were made by P. STEVENS in MAASTRICHT, Netherlands and by P.D. Lunensloss in Germany. Many blades were made in Liege, Belgium and marked with a Belgium inspector marking. This is the first bayonet pattern converted to the second pattern. A very rare and interesting bayonet in an Excellent condition.